Say goodbye to wasted space forever! American Tank Company’s rectangular tanks are specifically designed to fill those unused long, narrow spaces in RVs, boats, tractors and trailers. With closed top, open top and light duty versions, we offer the industry’s most extensive line of these hard to find water holding tanks. 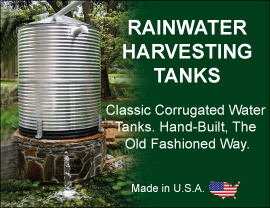 Developed for the safe, reliable storage of potable water, gray water and most agricultural and industrial chemicals, American Tank Company’s rugged, impact-resistant holding tanks won’t leak, chip, rust or corrode. And with a complete offering of tank fittings, caps and lids, it’s easy to customize our units to meet your needs. Call American Tank Company today and talk with one of our experts about your rectangular tank options. Though these tanks can be placed in any position, if they are placed up on edge with a height of 18" or more, they will need to be fully supported and braced or tank failure will occur. Call toll free today: 1-877-655-1100 to speak to one of our friendly and knowledgeable Rectangular Tank Specialists. Though our line of holding tanks is ideal for use as rv holding tanks and rv holding tank system, they can be used in a variety of circumstances. Call one of our specialists today to get more information on our full line of water holding tanks.